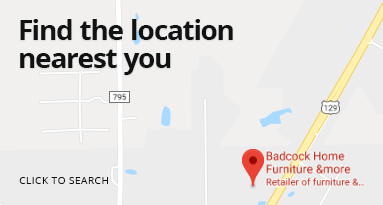 At Badcock Home Furniture &more in Valdosta, Georgia, we provide customers with affordable home furniture and appliances with style to match. We believe everyone deserves a beautifully furnished home, and we offer easy financing with payment plans that fit your needs. Stop by 3406 North Valdosta road Valdosta, Georgia 31602, and explore our large showroom located on North Valdosta Road North of 5 points. We are open Monday through Friday 9:30 a.m.-7:30 p.m., Saturday 9:30 a.m.-6:30 p.m., and Sunday 12:00-5:00 p.m. For questions or more information, please call us at (229) 242-4034. We look forward to helping you find your next favorite piece of furniture!